Greetings on Founder’s Day, the day the Institute celebrates the life of Saint La Salle. Hence, in order that teachers and student teachers may have a role model to imitate… Saint John Baptist de La Salle be marked…as heavenly patron of all teachers, men and women alike, clerical as well as lay, actually engaged in, or preparing for, the profession. The Lasallian mission is alive and well around the globe because so many women and men, Brothers, religious Sisters and Priests are themselves wonderful role models of compassionate, caring educators who excel in their ministries and are innovative in providing a human and Christian education to the poor, the young, and the adults they encounter each day. This is what we celebrate today, and this is what we are thankful for. We are women and men of faith. And as Pope Francis recently said to the leader of the Major Superiors of Religious Men in the United States, when “we remember our heritage, we have the capacity to understand the present and we have the courage to place tomorrow in the hands of God.” As Lasallians, we believe in God’s divine providence for us and his guiding hand in all the events of our lives. This gives us the capacity to understand the present and the creativity and hope to build a better tomorrow for all those entrusted to our care. 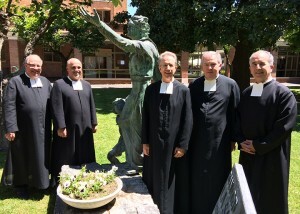 Finally then, I wish to share with you that on this feast day, the Brother delegates at the 45th General Chapter harkened to the call of the 43rd General Chapter in 2000 that defending the rights of children be a major focus of concern for the Lasallian mission. We sent a letter today to the president of Nigeria urging his intervention and efforts to secure the release of the more than 200 Nigerian school girls kidnapped by terrorists last month. Our Brother delegates from the continent of Africa personally delivered the letter to the Nigerian Consulate here in Rome. Let us pray for these girls and that they will be safely returned to their families.